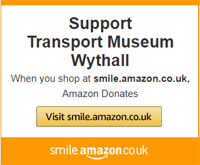 Thanks for your interest in supporting the museum. Any financial support you are able to offer would be greatly appreciated and enable the Trust to continue both its current level of activities and to develop new projects. Payments may be made online via the Paypal website (even if you do not have a Paypal account). Please click the button below. NOTE: You may add any additional information about your donation on the final checkout page.